Today, I’m 4 pounds and 9 inches smaller than I was last week. Let me tell you something, doing this whole diet thing? It’s rough. You have to get yourself into this mindset where you’re finally tired of feeling the way you do. For me, that comes and goes until about a month ago. I decided i was tired of avoiding the mirror and feeling gross every day. Call me what you will but I don’t feel pretty and damnit, I want to feel pretty. I want to put on a pair of jeans and say, “hell yes.” I haven’t said that in a while, y’all. A WHILE. …and I love jeans. Entrepreneurship finds me sitting in either my bed or my office for very long, extended hours. It finds me forgetting to eat until about 3:00 and then I’m not hungry for dinner but I force it in because, family dinner. It finds me drinking sweet teas all day to keep me on a steady sugar drip. It finds me just generally feeling bad about how much I weigh. There. I said it. I don’t want to be the fat girl. I want to feel good about standing in front of people as I talk about how to grow a successful business. I can’t do that without actually thinking about what I eat. I read that you can’t overcome a bad diet with a workout and boy, I tried. I did. Nope. Can’t do it. Even Orange Theory couldn’t do it and I almost died on that rower. I’ll also be honest and say that I started this with a different program altogether as far as products go. I wasn’t using Young Living products because I didn’t want to be that girl that is completely shut off to other products that might work better just because I’m connected to one health and wellness company. I’m telling you 100% truthfully, the Young Living Pure Protein Complete is BY FAR the best tasting protein I’ve tried (and I tried 5 different kinds before settling). Less sugar, doesn’t taste like disgusting aspartame and more protein compared to many I tried. I even tried another cleanse/antioxidant drink but could not get it down the hatch. I literally gagged the others up (Michael thinks I’m a weenie). Oh, well. Back to Ningxia I go. If taste matters to you, you’re about to be real glad to have YL products around for you. So look, here’s what I’m doing for my first 30 days to help me retrain my taste buds (which is already working) and get used to this routine of eating more. It feels like all I do is think about food right now, which isn’t all that great but 30 days. I can do 30 days. My trick is setting my phone alarm to remind me to get up, take a work break and eat food/drink water. I have NO CLUE if this will work for everyone else, as hard as it is right now, it’s what I feel like I have to do to get started. More water. Slam it and go. I’m trying to avoid refined sugars but I prefer the taste of sweet to salty so I’m in for a half apple. I hate nuts, but Michael is doing unsalted almonds here. You can also do a bar if you’re a bar person. There are tons of snack options on Pinterest. Go there. Usually by this point, I’m getting angry without having actual food to eat because it’s right around my first meal of the day time. So I need something crunchy that feels like food. For me, that means a couple of slices of cheese and some multi-seed crackers, maybe some grapes. They’re basically baked, 100% whole grain, cholesterol free, gluten free crackers. I would have thought they were disgusting a week ago but they’re like manna from heaven at this point. I eat a regular meal. Meat, vegetables, sauces on the side, natural fats (like olive oil and avocado), and I even have some carbs in there, friends. Rice, bread, etc. I just don’t make it the MOST on the plate. I make it the least. Sometimes I have a LaCroix at dinner so I have a drink with some flavor in it but it’s not my favorite. I usually want to snack at around 8:00pm. After 30 days, I’m going to let myself have a glass of wine with dinner or after and some dark chocolate. Right now, I’m cutting the wine and I’m doing a small amount of dark chocolate so I’m not tempted to eat a bag of gummy bears. I’m trying to do it earlier than later and when I feel sad about not eating chips, I go to sleep. Here’s the kicker. Once a week, I’m doing a fast day to help give my system a little rest. On these days, I do Ningxia Red 4 times a day and every hour or so between that I have a very small amount of food. So small that your digestive system doesn’t have a chance to work. So I’m talking 1/4 apple. Like 4 almonds. I keep up the supplements but cut out the shakes and the meal. Just plan on being extra yell-ish that day. I yell a lot when I don’t eat food. I don’t like to be told no. You will feel hungry and it’s not pleasant (even though some diet people will tell you how amazing you’ll feel, I haven’t gotten there yet if it happens at all). I actually read that’s what Jimmy Kimmel does weekly and from what I’ve read on a weekly fast day, it makes sense. I am going to keep at this for 30 days. Hopefully sugar tastes horrible to me then and I want nothing more than gluten free bread and chicken breast. Hopefully I also weight 125 pounds. Doubtful. I like food and I’m going to eventually eat it again but I’m not going to be having a cheat day until 30 days. Then I’ll see how I feel. I’ll come back to you someday, Chick-Fil-A. I know you miss me. I see the free sandwich coupons you’re sending me. I seriously, don’t know if this will work for everyone. This is the combination of a bunch of things I’ve read and a program I had a friend tell me works. I just adapted it to what will work for me and what doesn’t work for me is protein that I don’t like and antioxidant drinks that taste so bad I gag. Here’s to 23 more days. I have tried to remove dessert but I get a sweet craving so I allow myself 6 dark chocolate chips after dinner. I take one at a time and melt them in my mouth as slowly as possible. It helps me keep out of the pantry looking for ding dongs. This sounds very doable, even for me. Best of luck to you Lindsay, and thank you so much for sharing! I seriously love you. Your beauty is inside and out friend, and after reading this, I’m so sorry that you are struggling with this! When my son was 3 months old, I did a 30 day clean eating program literally, called the 30 clean (i just sent you an invite to their next challenge). Essentially, its an “elimination diet” and in those words, it sounds negative, like you are eliminating a lot of things that you could be enjoying, but it is quite the opposite!!! It is just a retraining of the body and the brain on what we have been accustomed to consuming (grains, gluten, dairy, sugar, processed foods, etc). It is based on whole foods, and led by a group of two amazing entrepreneurs that join you on the journey to changing your views on food (accountability in numbers). I gifted the program to my stepmom for Christmas. She lost 30 lbs and has never gained it back just by keeping up with the healthy eating habits and is so grateful. I watched so many women regain their energy while reaching their weightless goals, and practically becoming gourmet chefs along the way. Sounds like you are taking the bull by the horns, but if you’ve never checked out a program like this, it could be exactly what you need ~ to still eat the good stuff (#givemeallthebacon), and watch your body transform. Whatever you do, you got this! LOVE YOU!!! You are SO right about getting the mindset going. I deal with that as I try to be motivated again to work on my LC program. Just want to say that 9 inches is SO huge. There are times that is the only progress….but hey, it is progress. So, congrats. Thanks for the other info. I have the protein complete on my ER for next month. As usual I completely love your true voice here. Admitting it is hard as hell and not sugarcoating it. I will be following your blog and suffering along side you, Slique CitraSlim, Shakes, PBFit and water in hand! Thanks Lindsay! ? Thanks for always being so real, Lindsay! 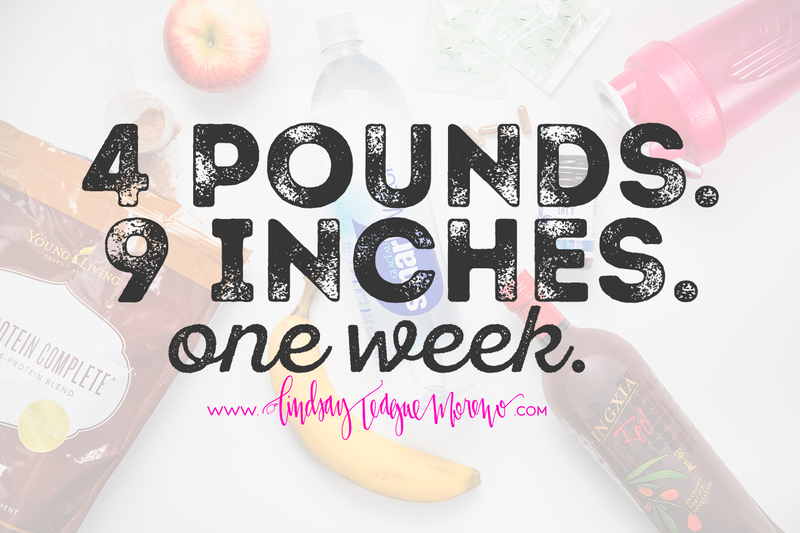 Four lbs is a lot in one week!! Ok…don’t laugh and I’m sure these are horrible on the healthy scale, but to get going on a “diet” I buy Carl’s Jr. Santa Fe Turkey Burgers (I think they are about 500 or 600 calories each). I have no excuse to get something I shouldn’t if I have these in the fridge and just need to remove the lettuce, etc., before heating up in the micro. Also, my treat is the dark chocolate covered banana slices – I think 4 of those bad boys is 100 calories. Also, I notice if I eat a pickle, sweets don’t taste so good after that. I accidentally found out cough drops do the same, but probably not recommended. haha Last, I just found some prepackaged smoothie ingredients at Costco – six packages per bag (kale, spinach, pineapple, apple and a different one that has, kale, spinach, raspberries, blueberries). If it’s prepackaged, I have no excuse to bail out that it’s going to take too much time, right? I can use water, but that’s kind of blah to me (right now), so I use apple juice and put a scoop of The YL Vanilla Spice Pure Protein and feel like I’m eating dessert. My last “trick” is plain Greek yogurt with organic frozen berries and a squeeze of organic honey. Savor that like it’s ice cream!! I’m trying to start this now — rather not add weight during the holidays and start the new year ahead of the game instead of behind, so every minus on the scale is a double win in my book!! I used to add more protein to my snacks like maybe add hard boiled egg … Also what helped me with craving was to eliminate carbs after 12 noon .. you see your body loves carbs and it will crave sweets after carbs especially at night .. when this would happen to me I would take 2 egg white 1 scoop of YL vanilla spice protein 2 drops of orange Eo and mix ..then make into a pancake with sugar free jam about 1 tsp.. so helps with after dinner craving and you get your protein.. I would eat an actual lunch , chicken or turkey with a salad or green veggie.. not sure if you have a trainer , I was just thinking your body doesn’t have enough nutrients .. Just my opinion and I see your doing what works for you.. just a lil insight to what has worked for me .. we are all different.. Good luck ..
Lindsay, when you set your mind to something there is no stopping you! First week was great! You may end up tweaking to fit your needs…but no doubt you will be successful. I get the trying to cut out sugar to reduce cravings, etc…but try to deny yourself 100% as it will get frustrating! Good luck! Lindsey! Don’t forget slique essence to cut any cravings bc I have started a similar thing and love slique essence whenever I feel hungry!!! I’m so proud of you! I am on a mission to get healthier myself and since you inspire me with everything else, I’m excited for you to inspire me with this. You go girl! I am trying it! Right where you were 4 lbs ago! Thanks for the inspiration! You really rock! And I love your hair! I would really suggest eating more food. Are you working out? Especially if you’re getting in a workout. Even if it’s a hard boiled egg or egg whites with something. I’m so glad you’re seeing success so fast, really. But I can promise you the results will last longer the less you limit yourself. You said it’s hard for you to eat actual food before dinner? Maybe it’s good to try and get on it. I hope you’re drinking water constantly at your desk too. Try a big bubba and add things like fresh fruit and cucumbers. I would love to give you some suggestions if you’re ever interested. This is working for me and I’m sticking it out for 30’days until I’m off of sugars and all that. I don’t like drinking water either. Add Grapfruit or Lemon or Peppermint EO to your water, it really helps with drinking more. Hi Lindsay, I am so proud of you and I’m inspired to try to lose some weight. None of my clothes fit me anymore and it makes me very sad. I was wondering what supplements you are taking. I’m starting something similar to what you are doing today. I need to lose about 20LB. Thank you for being so open and transparent with us. How are you doing now? I started following your “plan” on Friday and am glad I didn’t eat any Halloween candy last night. Big step! I’m resisting a daily weigh in or else I’ll go nuts. Trying to give it a week. Would love to know if you are sticking to it! Doing great. I’m now 3 weeks in. 10 pounds and 30 inches down. WOOT! When you say you’re taking Slique CitraSlim Caps twice a day, are you taking two sets of the packets a day? I bought four boxes of the caps and haven’t taken them once because I wasn’t sure if you were supposed to take the packets at different times or if it’s ok to take both packets at once. One packet. Take them one in the morning and one afternoon. Just checking in on you girl. How’s it going? You are a tough cookie, so I am sure you are winning in this weight game! Would you share how you make your shakes? I tend to make one and it’s so big, I’m sure that I am consuming more calories than if I were just to eat the damn muffin… Thanks! Doing really good! I’m 16 pounds down and a size in top and bottom! Chugging along!!! Waayy random, but how did you make the above graphic? Love the plan. Thank you for sharing.